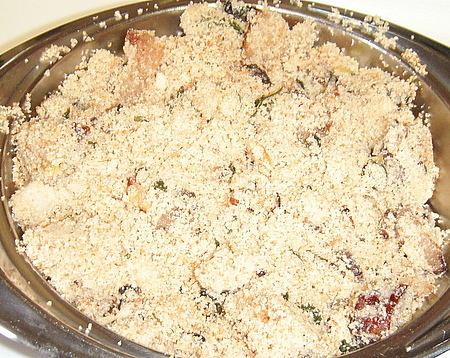 Farofa is eaten in Brazil almost as a condiment, available with every meal. It's simple to prepare (as long as you are not making the cassava flour yourself), though a little bit strange in its dryness to non-Brazilan audiences. I thought it went well with the feijoada, but wouldn't make it just for the hell of it. Our friends Desiree and Grant, who've lived in Brazil, thought this was a pretty authentic version. This was my second time making farofa. I'd previously made it for my Bahian meal. The recipe, however, is somewhat different. Sauté the onion and bacon in the oil. Add the manico flour a little bit at time, stirring. Add the parsley, green onions and salt and pepper and stir well. Cook until the flour is toasted. Adapted from a recipe at sonia-portuguese.com.